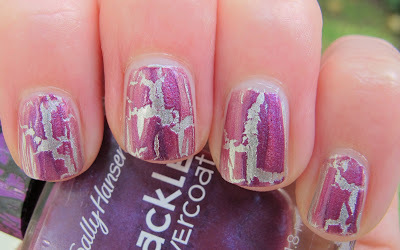 Every time a post a crackle polish, I remember that I seriously love them. I know I own quite a lot of them, but I really do love all of the different colors/finishes. 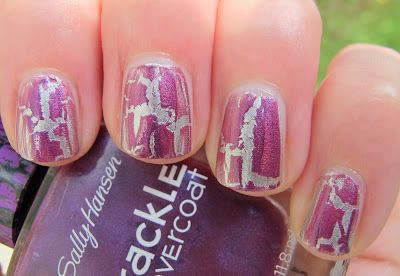 Sally Hansen Vintage Violet Crackle Overcoat is an especially gorgeous crackle. It's a beautiful shimmering violet colored crackle. 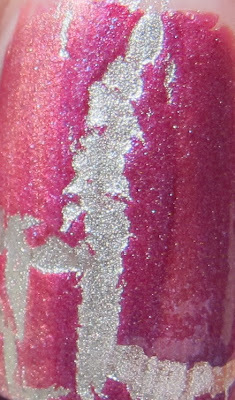 Some other brands have had difficulties with shimmer crackle formulas, but not Sally Hansen. This cracks really well and is easy to apply. For this look, I used one coat of Sally Hansen Silver Sweep Insta Dri polish, with one medium-thick coat of Sally Hansen Vintage Violet Crackle Overcoat. It's a nice and easy look, as both of these polishes dry super quickly! I think the picture below might be the most color accurate. This polish is really a blue-purple, but cameras hate representing purple properly! Sally Hansen Vintage Violet is available at drugstores. Find one near you on their website. This polish was sent to me for review by a PR agent for Sally Hansen. For more information, please read my Disclosure Policy. i really love this color of crackle! 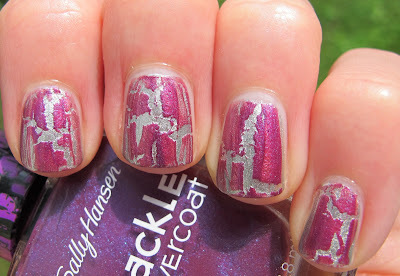 Peace, Love and Polish- I definitely understand not liking crackle, but I myself do appreciate a good one from time to time!! imfeelingnail-venturous- thanks! Have you tried any of the Sally Hansen crackle overcoats?